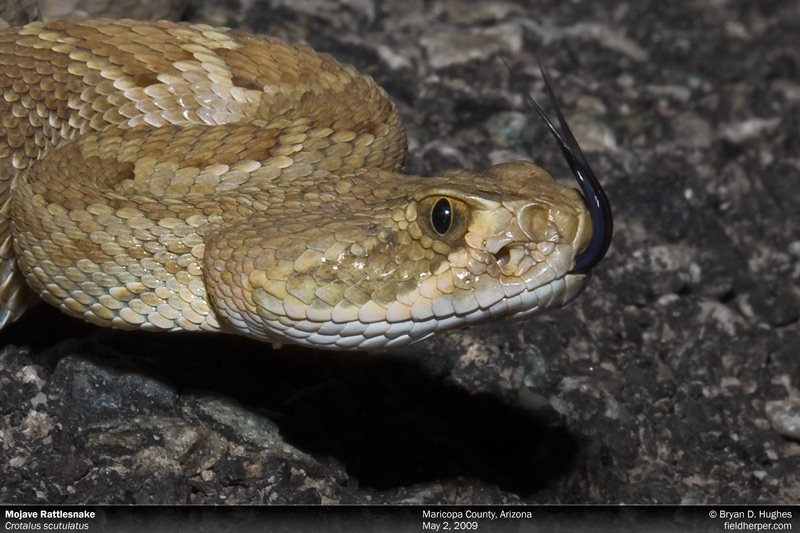 Here’s a nice example of one of the variations that can be found in the Mojave Rattlesnake (Crotalus scutulatus). This one was fairly uniform in color, with a minimally distinct pattern, all in various hues of peach, brown and orange. 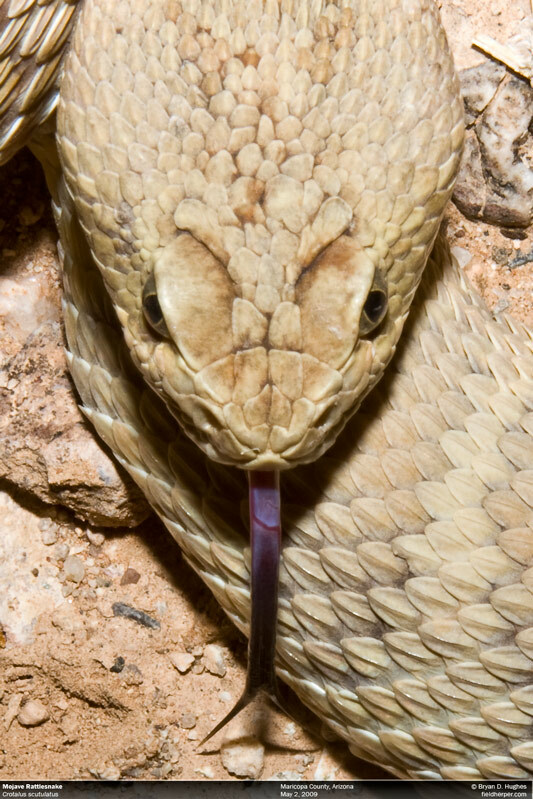 To people who aren’t experienced, the Mojave Rattlesnake can be difficult to distinguish from the Western Diamondback Rattlesnake. Their convergent patterning and tail banding can be confusing without an understanding of some of the basic differences in their physiology. Below is a photo of one of these differences, the number of scales between the ocular scales which cover the eyes. In the Mojave, there are 2 (occasionally 3). 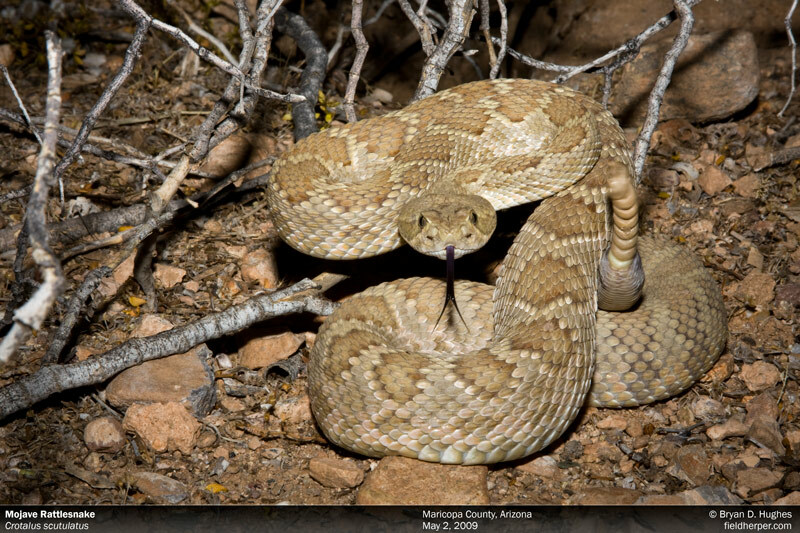 In a Western Diamondback, there are 4 or more. 2 Scuts between the eyes. This entry was posted on Monday, August 10th, 2009 at 12:56 am	and is filed under Field Herping, Research. You can follow any responses to this entry through the RSS 2.0 feed. You can leave a response, or trackback from your own site. counting the scales between the ocular scales..I am not sure I would want to get close enough to try to make the determination! BREATHTAKING ! Growing up in the southwest, these creatures became familiar hazards; your images have given me a fascinating new perspective. Thank you for sharing.